Floods, landslides and huge waves could put millions at risk as Typhoon Mangkhut hurtles towards the Philippines and Hong Kong. The tropical cyclone is expected to smash into the northern Philippines this weekend and bring with it a trail of devastation to the disaster-prone country, rescue workers have said. Emergency workers have been deployed to the north of the nation's main island of Luzon, where Mangkhut is expected to hit on Saturday. The cyclone is currently working its way through the Pacific with winds of up to 160mph. The Philippines' state weather service says it will be the country's strongest typhoon this year, with winds peaking at 168mph on Thursday before easing slightly as it hits land. Philippine Red Cross chairman Richard Gordon said: "We're worried for the 10 million people in the Philippines living in the path of this destructive storm." The charity estimates three million people in the country live in the direct path of Mangkhut. 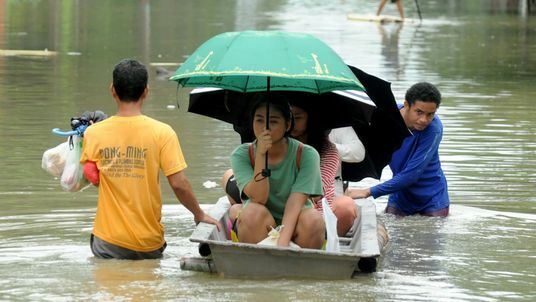 The typhoon is expected to make seasonal monsoon rains in the Philippines even more intense and put a further seven million people at risk. Philippines' Office of Civil Defence chief Ricardo Jalad said low-lying areas in northern regions would be evacuated on Thursday.